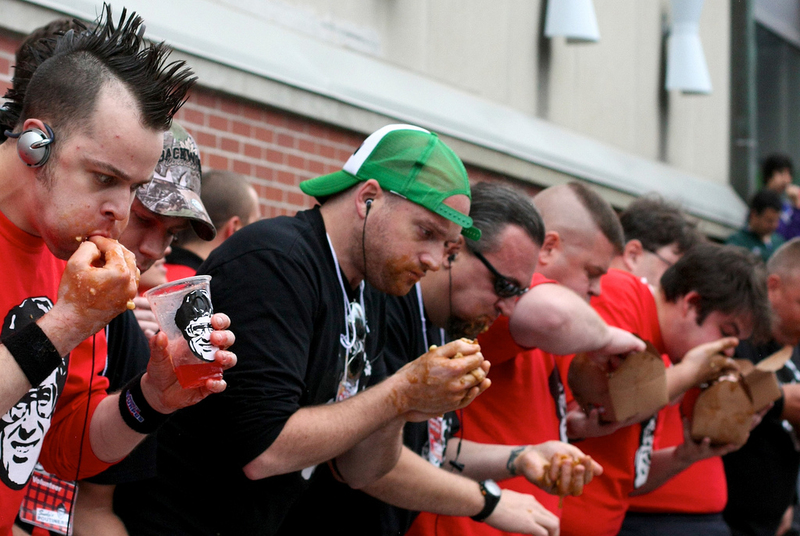 Devoid Of Culture And Indifferent To The Arts: Recipe: Is Poutine haute cuisine? It’s French…. Recipe: Is Poutine haute cuisine? It’s French…. 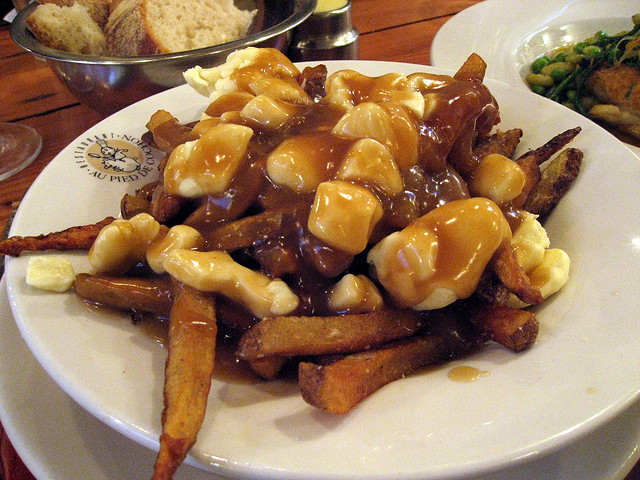 Poutine is a guilty pleasure of many people around the world. Born in rural Québec in the 1950, it has now transcended its humble beginnings to not only greasy spoon diners, but also higher end restaurants where “traditional” toppings are replaced with luxury food items. I highlighted “traditional” because originally there were no toppings. They are all later additions. This sinfully delicious dish takes only 3 main components: medium thick cut french fries, chicken gravy (or “brown” sauce – equal parts chicken and beef broth) and fresh cheese curds. It’s actually quite delicious when it all comes together. The hot gravy melts the fresh cheese over and into the fries so you have a fantastic cheesy, stringy forkful every bite. Chips and gravy are quite common in takeouts and diners in North America, but it’s the fresh cheese that transforms it into poutine. No fresh cheese, no poutine. Sadly, not very low in calories either. But what good in life doesn’t make you fat? You don’t have to heat up the deep frier unless you actually want to. I have had some great results lately using frozen french fries you bake in the oven. One local Canadian brand (McCain’s) has an extra crispy style that actually has the texture of deep fried when baked. This is a Godsend to me, as regular readers will know of my aversion to pots of oil on the stove. Also a little more healthy one would assume. 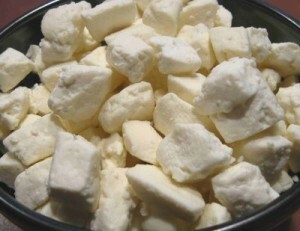 Fresh cheese curds are the solid parts of soured milk used mostly in Canada and the northeastern/midwestern United States. They are available locally from the grocery in little bags, and in Canada are almost always a product of Quebec. These unripened irregularly shaped balls of cheese are not really able to be substituted. If it’s absolutely impossible to get them either mozzarella or mild white cheddar can be used, but it isn’t the same. Place hot fries on your plate or in a bowl. Sprinkle cheese curds over the top and ladle the hot gravy over the top. Let it sit for a minute for the hot gravy to melt the cheese. Don’t turn your nose up at the lobster. Veal with lobster, and a light “sauce,” is a common upscale restaurant dish, and is delicious. Just change the basic gravy above to something less "beefy" in the recipe. If you like this post retweet it using the link at top right, or share it using the links below. Recipe: Homemade Donair Pizza. Even the meat! Election 2011: Huh? What just happened? Election 2011: The Writ will soon be dropped. Recipe: Chipotle Ketchup. Hot and Spicy! Gardening: There’s no stopping it now! Recipe: Liqueur of the day is Raspberry!